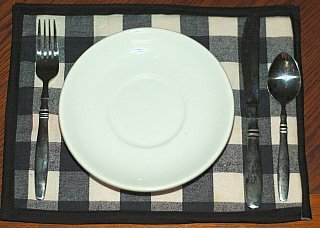 Dinner placemat, easy directions to sew. 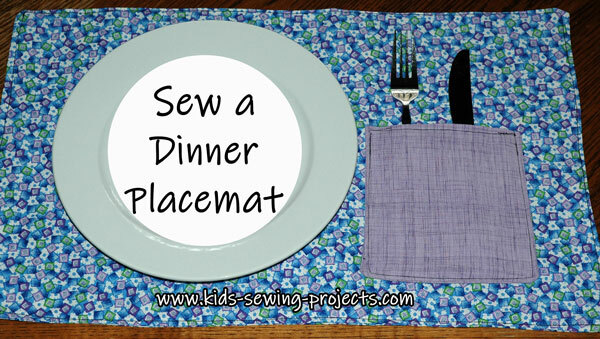 This is an easy way to sew a dinner placemat. You can change this into a seasonal placemat or birthday placemat just by using special fabric. Place piece of felt in between two pieces of fabric with the fabric right sides facing out. Pin bias tape all around edges. For further directions on sewing with bias tape see these sewing instructions. Sew in place. This makes one place mat. To make a matching set, you will need twice as much material. One side of the tape should be on one side of the material and the other side of the bias tape should be on the back side of the material. * For a larger size place mat use 13x17 inch fabric and 13 x 17 inch felt. 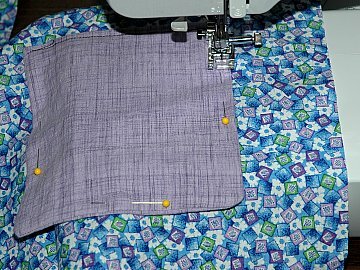 This makes one placemat, if you are making more than one you'll need to have the correct amount of fabric per placemat. Place pocket squares right sides together. Stitch along 3 sides leaving top open. Turn right sides out. Iron flat. Tuck top edge in slightly and top stitch. 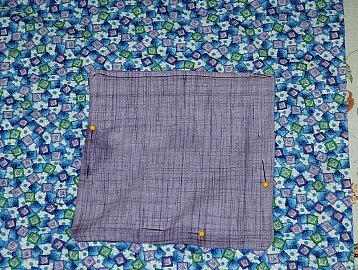 Pin pocket to one rectangle toward the right side of the placemat. Sew along three sides leaving top open for the pocket. Place the two 13"x21" rectangles right sides together. Sew along sides leaving 1 inch opening. Turn right side out. Tuck edge in and iron flat. Top stitch all around edges.